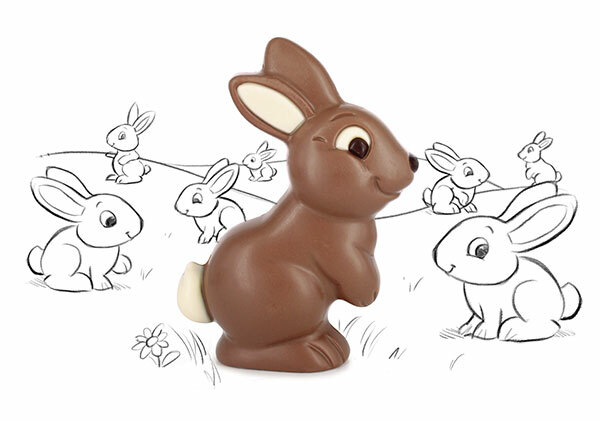 Our high-quality chocolate figurines and gift packagings are the result of uncompromising attention to every detail. The finest natural ingredients bound together with genuine Belgian craftsmanship. The finest natural ingredients bound together with genuine Belgian craftsmanship. That beautiful gloss, the distinctive sound when you break it, the way it melts in your mouth... Producing a divinely delicious piece of chocolate which maintains every treasured quality throughout its shelf life isn't easy. It requires real Belgian craftsmanship! At ChocDecor, we attend to every detail, practicing our art with patience and respect for the traditional Belgian chocolate manufacturing process. 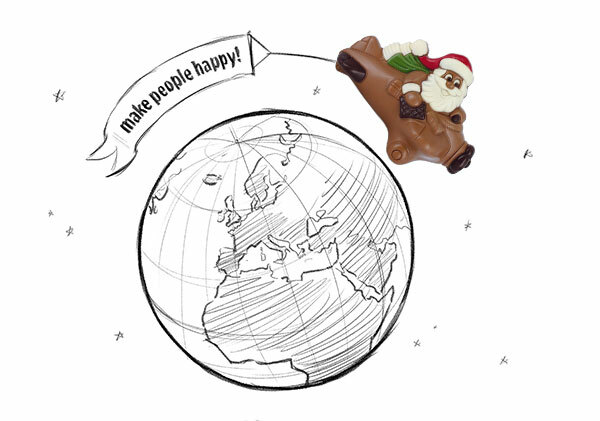 We are very proud that all our chocolate figurines are still made in Belgium. Our secret chocolate recipe comprises only the finest ingredients, such as top quality Madagascar cocoa beans, 100% pure cocoa butter, whole milk powder, soy lecithin and a dash of natural vanilla from Madagascar. While our choice of cocoa bean imparts the distinctive light red, warm color and flavor, our intensive grinding and conching process brings about our chocolate's complex nature and extra fine texture. All our ingredients are free from artificial flavors, colors and fats. They are also GMO-free and contain no preservatives or vegetable fats. In Europe, only E-approved colors are used. Our decorated chocolate figurines and lollipops are passionately hand crafted to exude personality, character and irresistible charm. Our decorated chocolate figurines and lollipops are passionately hand crafted to exude personality, character and irresistible charm. ChocDecor chocolate figurines are renowned for their personality and character. "They are so adorable", "Who can resist that lovely smile?",... are the kind of comments we frequently receive. 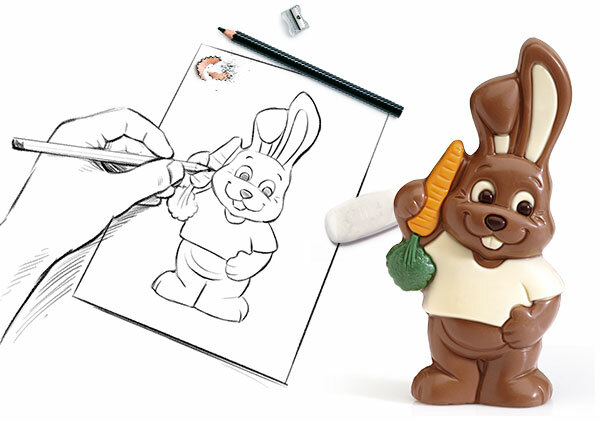 We pay huge attention to developing the look, feel and finishing of our chocolate figurines. All this is done by our skilled in-house designer and model maker together with a whole team of people who are passionate about creating something special. It's their drawings, craftsmanship, opinions and playfulness which infuses our characters with the heart and soul that our customers love so much. 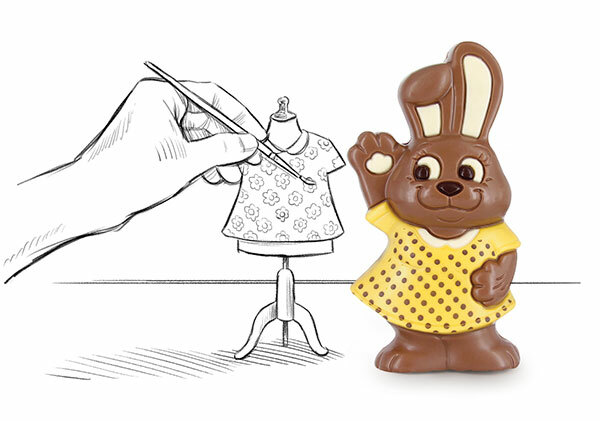 See Our Figurines to discover our characters' journey from drawing board to chocolate-ready product. Our dedication to delighting chocolate lovers inspires us to keep inventing enticingly beautiful and delicious chocolate creations. Our dedication to delighting chocolate lovers inspires us to keep inventing enticingly beautiful and delicious chocolate creations. ChocDecor has a proud history of creating innovative chocolate concepts: In 2002 we were one of the first companies to offer decorated seasonal chocolate lollipops In 2005 the decorated chocolate bars were introduced Our Finger Pup'pets won the 2nd prize in the Top Innovation Award at ISM 2014 in Cologne. Launch of the Long Pops and Swirl Pops (lollipops with different textures) in 2015. At ISM 2016 we introduced DCoré+, THE innovation in the world of decorated chocolate. This unique, patented chocolate printing technique of ours enables us to add incredible detail and character to our chocolate figurines. Find out more about DCoré+. At the Wabel Grocery Summit in Paris we won the innovation award for seasonal confectionery We are always seeking out new adventures and new ways to satisfy our customers. Ready to be inspired? Check out our private label section with some exciting tailor made chocolate concepts. To keep pace with all technological changes, we are participating in the Factory of the Future Awards in 2020. This program recognizes Belgian manufacturing companies that have turned themselves into agile, high-tech organizations. We are as dedicated to quality customer and supplier relationships as we are to producing the finest Belgian chocolate. Attention to every detail ensures our top quality Belgian chocolate satisfies in every way. Attention to every detail ensures our top quality Belgian chocolate satisfies in every way. Only top quality ingredients are used in our own premium Belgian chocolate recipe. Our uncompromising eye for detail ensures every figurine is finished to perfection, emanating the passion, happiness and love that MAKES PEOPLE HAPPY! 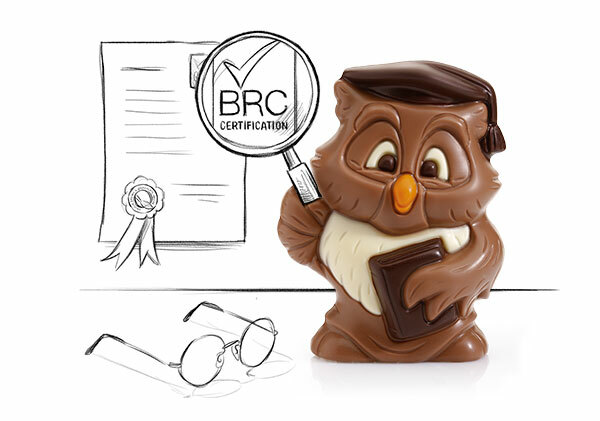 We are BRC grade AA+ certified. It's the highest quality certification that you can achieve. Moreover the extra '+' is referring to the fact that the audit was unannounced. Only 10% of the companies achieve this high score! The AA+ certification underpins that we are a reliable chocolate manufacturer: our production meets top level requirements of hygiene and high product quality. Our high quality packaging both looks wonderful and perfectly protects the chocolate against breakage. Together with our suppliers, we conduct lots of (transport) tests for suitability. We continually invest in high quality resources, to ensure we have people with plenty of know-how and expertise, together with high tech equipment and facilities for production, packaging, warehousing and more. We love to put a smile on our customers' faces. 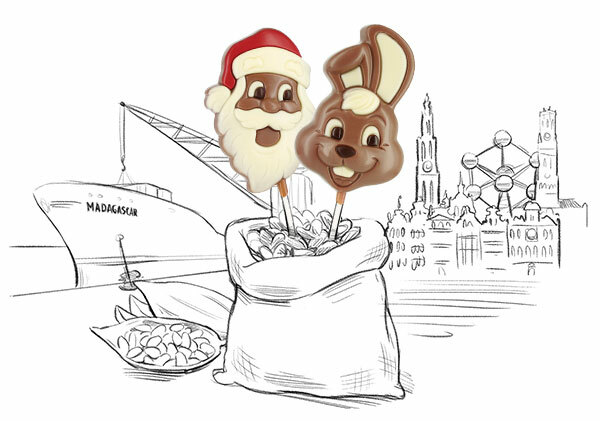 We have the experience and know-how to successfully export high quality Belgian chocolate. We have the experience and know-how to successfully export high quality Belgian chocolate. Our chocolate figurines love to explore the world. And with a presence in more than 50 countries, it's our pleasure to enable them to do that! Our broad export experience means we know how to deal with specific needs of many different countries, such as legislation, labelling, customs and transport (air, sea, railway and road). In this global playground, we satisfy a diverse range of customers. From chocolate shops and bakery shops to supermarkets, wholesale and e-commerce. ChocDecor is the ongoing realization of one chocolate lover's passion for creating and sharing happiness. ChocDecor is the ongoing realization of one chocolate lover’s passion for creating and sharing happiness. Once upon a time, there was a young man called Luk who lived in a small town in Belgium. He had a passion and a vision: to create the cutest decorated chocolate hollow figurines and lollipops and share them with the rest of the world. And so, more than 20 years ago, ChocDecor's magical journey of taste, skill and creativity began. A dream brought to life in his mother's garage has now become an established business, with a proper factory and warehouse. A pleasant place which provides permanent jobs to over 50 people, with numbers more than doubling during peak season. Today, Luk Patyn's positive attitude and entrepreneurial spirit are still the beating heart behind ChocDecor's success as a leading manufacturer of high quality, innovative, decorated chocolate. Always keeping in mind the well-being of this staff. 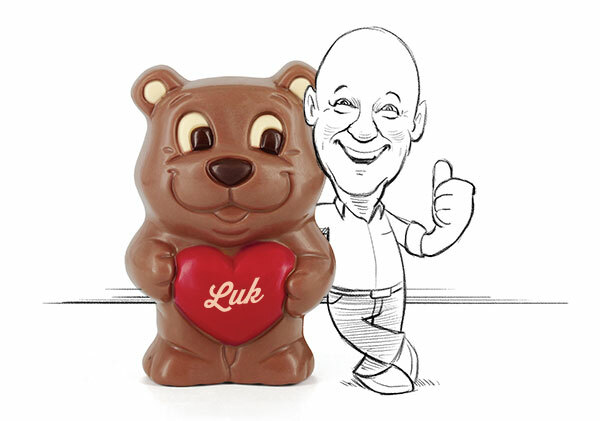 Together with you, Luk is looking forward to bringing many new chocolate stories to life! We ensure our chocolate creations are protectively and attractively packaged so they arrive in perfect condition for sale. We ensure our chocolate creations are protectively and attractively packaged so they arrive in perfect condition for sale. Exquisitely crafted chocolate needs packaging that's just as perfect. Packaging that protects from breakage, while being as attractive as our delicious, beautifully decorated chocolate creations deserve. ChocDecor packaging is robust and extensively tested for suitability. Whether you want to have our beautifully decorated chocolate delivered in bulk to pack yourself, or prefer it to arrive in a beautiful, shelf-ready gift packaging, all is possible at ChocDecor. You can choose from our wide range of original, upscale gift or shelf-ready packaging. Or if you have other bright ideas, tell us about them. Together we can make every chocolate presentation become a reality. Our manufacturing facility is designed to accommodate changing customer needs. Our manufacturing facility is designed to accommodate changing customer needs. Our know-how, expertise and investment in fully automated production lines mean we have the flexibility to produce the right quantities of chocolate figurines, lollipops and relief figures for every size of business. To maintain this customer synergy going forward, we are participating in the Factory of the Future Awards in 2020. This program recognizes Belgian manufacturing companies that have turned themselves into agile, high-tech organizations.